DOGOPOLY – Fun for Everyone! DOGOPOLY bringing the “opoly” theme to new levels! High Quality Features & Flea Flickin’ Fun! Created over 175 dog years ago, DOGOPOLY is the original “opoly” game for the pet lover in all of us. 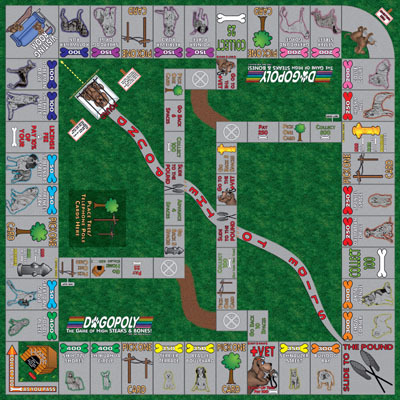 Players take on the role of dogs walking on the sidewalk around the neighborhood and encounter things in a typical dog’s life, including Trees, Telephone Poles, Fire Hydrants, and the Park. While trotting around, stop Home to get some bones, but don’t get caught by the dog catcher or you’ll end up in the Pound! And don't get hurt while sniffing around the neighborhood or you’ll have to go to the Vet. While wandering, detour into one of the alleys then try taking one of the Cats Crossing paths to the other alley. This allows you to run around the neighborhood even quicker, or to by-pass other dogs’ territories. In this game, when you buy a territory you’ll want to build a doghouse right away to start renting it at the first opportunity. Build even more doghouses when you own more than one territory with the same color. And, of course, the currency here is bones! Use your bones to buy all the territories and own the neighborhood! This game is made for quick fun. Three suggested versions of play are included in the rules for even quicker games!